A.J. Mahari has written 3 ebooks that all deal with aspects of what she has termed the “core wound of abandonment” in Borderline Personality Disorder. 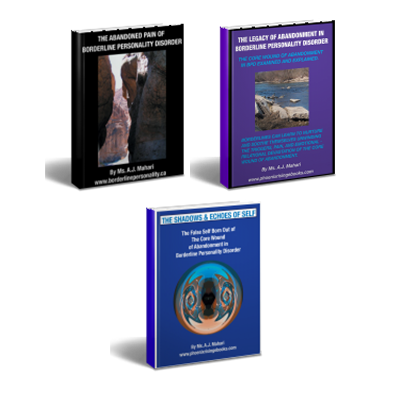 In this bundle you can purchase all 3 ebooks together. A.J. Mahari has written 3 ebooks that all deal with aspects of what she has termed the “core wound of abandonment” in Borderline Personality Disorder. 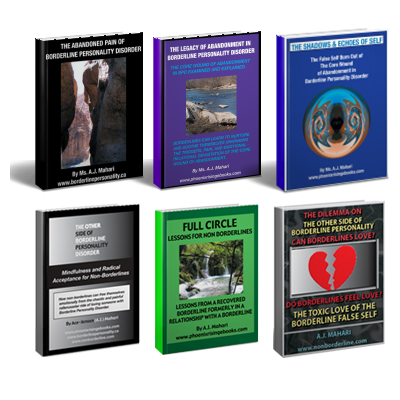 In this bundle you can purchase all 3 ebooks together. 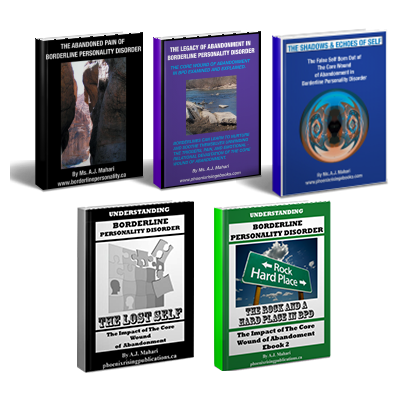 This purchase package is for anyone wanting to learn much more about Borderline Personality Disorder whether you have BPD or are a non borderline and know someone who had BPD. Also available now is A.J. 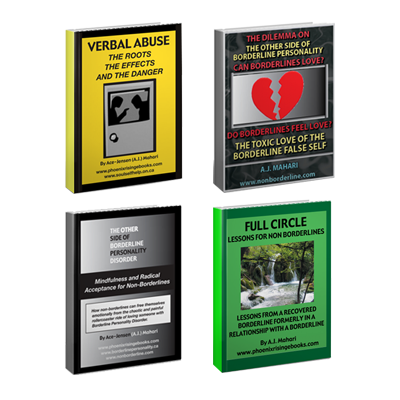 Mahari’s Core Wound of Abandonment In BPD 5 Ebook Bundle. The 5 ebook bundle includes these two additional ebooks. A.J. 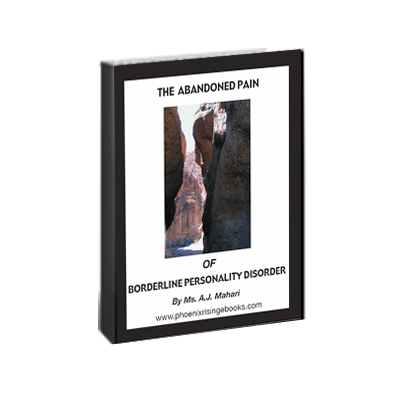 examines the reality that, for those diagnosed with BPD, the abandonment of one’s own pain is the result of the distorted belief that it must be escaped at all costs. Outling that those who go on to develop BPD had to initially abandon their pain in order to actually survive psychologically, albeit in fragmented pieces. However, in adulthood those with BPD must now welcome back in this abandoned and dissociated pain in order to integrate the fragments of self. It is these fragments of self and the loss of one’s authentic self that leaves those with BPD without a known identity or stable sense of a known self. Being held at bay, dissociated from one’s own authentic self by this abandoned borderline pain is what keeps those with BPD so stuck in untold profound suffering, isolation, learned helplessness, and alienated loneliness. 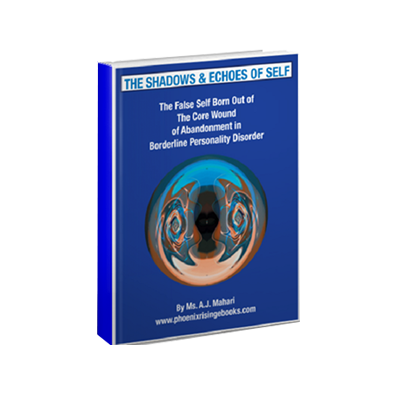 This ebook presents a thorough examination and explanation of the core wound of abandonment in BPD. It is the second ebook in a series of 5 exploring various aspects of what A.J. has termed the “core wound of abandonment” that she identified in her journey of recovery as the wound that is central to what BPD actually is and how and why it persists. Mahari examines what she calls “the core wound of abandonment” as one who has been there, as a woman who had BPD and has recovered. In this comprehensive ebook, A.J. outlines the definition, scope, and meaning of the core wound of abandonment. She describes it as the central wound that drives the emotional and relational devastation experienced by those with BPD, those who treat them, and those who care about and/or love them. The anatomy of the core wound of abandonment is examined and explained. Along with her own experience of abandonment and her ruptured relationship with her own mother, A.J. has written an unbelievably detailed and insightful examination and explanation of the core wound of abandonment. A.J. 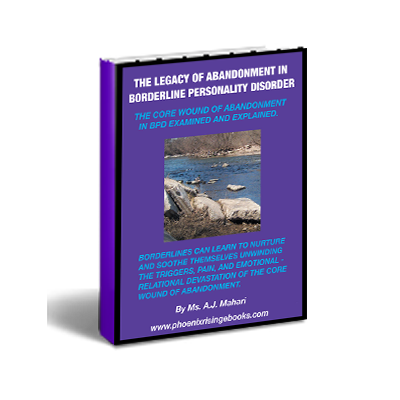 offers her readers, in this ebook, a detailed look at how and why the core wound of abandonment is so destructive to those with BPD and everyone who gets anywhere near them relationally. A.J. writes that the destruction of the core wound of abandonment leads directly to the loss of self – a loss of authentic self that creates the false self organization of Borderline Personality Disorder. She also offers solutions and maps out the things that every borderline needs to learn if they want to recover, as A.J. has. A.J. shares the steps that she had to take, the pitfalls that block change and the awareness required to get on and stay on the road of and to recovery. Whether you have BPD or are in (have been in)a relationship (friend, family member, significant other, ex-partner) with someone with Borderline Personality Disorder, as well as any professional treating someone with BPD will benefit from the insight A.J. Mahari shares from her own borderline experience, and her journey to her recovery from BPD. In this ebook A.J. Mahari examines the root cause of the false self in BPD. Included is a comprehensive look at the similarities and differences between Borderline Personality Disorder (BPD) and Narcissistic Personality Disorder (NPD). A.J. Mahari delves into the subject of cultural narcissism as a backdrop for the narcissism housed within BPD exploring the reality that narcissism is not just a stalwart of NPD. Mahari explores various archetypes and myths aimed at increasing the readers understanding of narcissism in a cultural context.